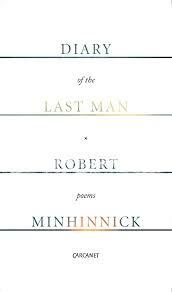 Robert Minhinnick’s newest volume of poetry comes to us in the form of a modest collection, wrapped in an austere white cover with narrow bands that leak bright, naturalistic details on closer inspection. Minhinnick, himself an established environmentalist, has filled his verse with wildlife and a sublime delight in nature. His “Song of Sleet” declares, “Sleet I love / in sloomy weather”, and continues in that vein. Aside from this, the poetry explores much more of the world which Minhinnick walks through, touching upon human lives and mourning absent friends. More than one poem in the book works as eulogy, processing the deaths of loved ones and distant strangers who met tragic ends. White and mauve as a marble Christ. whereas “15. London Eye” is much longer, much angrier at both the protagonist’s plight and the world left behind. The poem is sad, cold – even when referring to summer – but not cynical or hateful, ending on an atom of hope. and today the sun is threatening to burn it back to the bone. will become sand’s surreptitious fables. a quiver of quartzites his fine fur. Minhinnick’s fondness for sibilance, “Smoke on the swale / Swarf off a swollen sea”, makes some of the stanzas hard to read aloud but fun to whisper to yourself, feeling private and personal. Diary does, later on, depart from Wales and the collection travels, addressing global concerns that echo back on our lives in the UK. Four poems under the title “Amiriya Suite” are set in Baghdad, dealing with the present reality of the war and occupation there. “Umm Ghada at the Amiriya Bunker” attests to Minhinnick’s skill with imagery, evoking “a fog of flesh” and “fire that jumped into their mouths” when describing a bombing, whereas “Side effects” is more opaque, seemingly just describing a man in a bar. Elsewhere, Minhinnick’s human subjects fall short of his naturalistic preoccupations. The poem “With the Body Piercers”, in particular, takes a surprisingly alienating view of its subject, with lines such as “And as my eyes grew used to the darkness / I understood to whom I was listening” bringing up surprise and revulsion. If Minhinnick’s natural scenes are endowed with a sublime immersive quality, “Body Piercers” feels like patronising objectification. The overall tone of Diary of the Last Man is, as with the poem that bears the same title, melancholic and solemn, but is not without levity of spirit. By and large Minhinnick’s themes are solid, his details exquisite, and his language masterful. The collection evokes great humility, both in awe of the wilderness it explores and the weight of life it considers.